Ah yes, the ends… I’ve just had that joy with the quilt. This is all looking splendid and is going to be the most interesting, colourful and unique sofa cover known to man. It’s getting there… I might have to pester my button-maker soon though as I would like to get this part of it finished before I embark on the next section (the seat covers). I love it and its wool amazing! I don’t envy the darning to come – so many tails. Thanks for sharing this treasure. The wine is helping the process slightly!! Your African Flowers look lovely, they will make a fab cushion. You have been extremely busy with the blues and greys, the collection looks amazing. All the work is fantastic but the African flowers will really make a statement I think. You deserve that glass of wine. I’m intrigued to see the buttons when they’re done. What a lovely colour combination. The squares are just lovely. I’m really liking working with these colours. Since, eventually, the whole sofa is going to be covered in them I decided I needed something relatively subdues!! 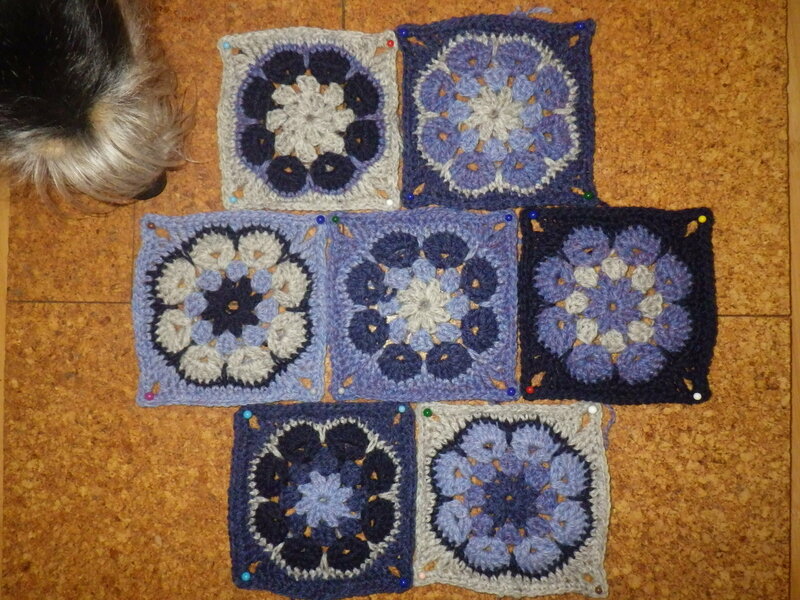 Loving the blue African flower squares! Now I’m done with my knitting kick, I’m definitely doing a few more tomorrow! I really love the colors on these! Thank you… I’m not sure the photos entirely do them justice! I have been working on these since about last July, so there are many hours in there!! This is adding up to an amazing project! I like the African Flower design a lot. Like Pauline, I wonder about how this will hold up, with pets and potential wine spills–do you worry? I have decided not to worry – we generally drink white wine and the dogs have learned not to chew things made of yarn! What could possible go wrong!? It’s going to be a bit mad, but very much ‘me’! I stopped by not only to read but to let you know your package arrived safely and intact. Thank you so much. Will post on my blog this week. My son and ex-DIL were quite impressed as well. Doing a happy dance here, I will send a card soon if I have copied the return address correctly. I love the work you have shown above and the colors are a day brightener. Thank you again.